Delta is rigid and reliable fan heater designed for harsh weather and rough environments, where fine materials and performance are required for example on building and construction sites or in ship building industries. Delta is also used for more permanent installations in production areas, warehouses, garages, factories and stables. It is easy to change from portable to permanent by using a wall bracket instead of the hand rail. The wall bracket must be ordered seperately. Delta is supplied with a 0 – 40°C thermostat which ensures an optimum service and minimizes the electrical consumption. A thermocut is also installed for safety against superheating. 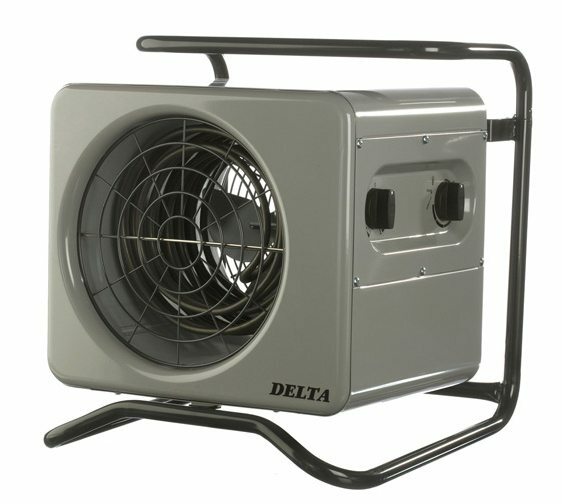 You can also order Delta heaters supplied with a 24 hour timerfunction (T). Delta is designed with an inner round shell which ensures that the entire air flow passes over the heating elements. In this way problems with cold areas and stagging airflow are avoided. The hand rail is removed, and by using the wall bracket the fan heater can be mounted vertically or in a 15° angle. Permanent installation must be carried out by an authorised electrician in compliance with current regulations. Delta is constructed of electrogalvanized steelplates coated with a 20 my coating in RAL 7004 (light grey). In larger quantities the fan heaters can be supplied in other colours.